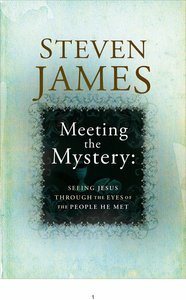 In Meeting the Mystery: Seeing Jesus Through the Eyes of the People He Met, you'll meet some of those people and their stories retold by master storyteller, Steven James. Sometimes we know their names; sometimes we don't. Sometimes we know how their stories ended; sometimes they've disappeared into the sands of time. In every case, though, the stories you're about to read are based on actual, true events. All of these storytellers met the Story himself. Much of the material is drawn directly from Scripture. Other stories are more speculative. Details and dialogue are sometimes added to make it easier to see and hear the stories unfold. But great care is taken in each story to be faithful as possible to both the spirit and intent of the biblical record. Jesus knew that the best way to teach people the truth was to wrap it up in a story. As you read these stories, you'll discover the truth for yourself. The truth about Jesus. The truth about the Mystery. And there's no turning back. Once you've been shown the truth that lies at the heart of the Mystery, once you've met him for yourself, you'll never be the same again.